Google+ Adventures with Baby Boo Bear: Weekend Recap - In advance! I usually do a recap of our weekend events. Not this weekend! We have a crazy busy weekend ahead of us, full of lots of family fun! However, I won't be blogging about it in a weekend recap. Instead I will quickly share our plans now! Today is my Birthday - yay! Happy Birthday to me!! I don't actually get excited about my birthday. This year isn't any different...butttttt....we are heading to Great Wolf Lodge and Niagara Falls tomorrow! So I guess I'm excited about that ;). Today we are heading down to the waterfront (weather permitting of course) for some fun at Twelve Ladies in a Tent. Maybe a visit with my family too! 1. My review on bringing a baby to Great Wolf Lodge. 2. How to strip diapers (it isn't as dirty as it sounds I promise). 3. I got my notification that my new dipes are enroute!! I will either be reviewing them, writing on how to prep charcoal bamboo dipes (also not so scary) or maybe both!! Of course, no blog is complete without a few pictures. So here they are! FINALLY prepped Emmett's new Tots N Bots CD! How cute is he?! 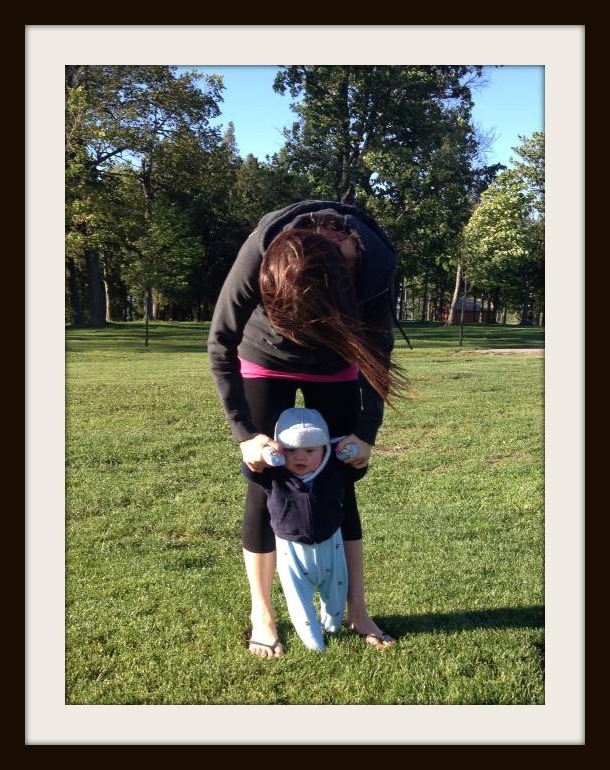 Emmett walking with his Aunt Marianne (loving known as Aunt M) at Craig's ball game last Monday. And now I'm off to enjoy my delicious smelling Birthday Breakfast Craig is cooking...smells amazing!! Happy Weekend Friends!